This is an amazing 3 day tour through the most beautiful views available, Grand Canyon National Park with stops at Mather Point and Desert View, Monument Valley in an open vehicle tour with the nicest people, the Navajo, Antelope Canyon, upper antelope, and the spectacular slot canyon and the most incredible pictures, Horseshoe Bend and the unique natural bend of the Colorado River, Zion National Park and it's incredible hiking trails all in an air conditioned vehicle with a knowledgeable guide. We will be leaving the Excalibur Hotel at approximately 7:00 am heading towards the Grand Canyon with stops in Kingman, Arizona, for coffee and snacks then continue our drive on the I40, the Interstate that replaced the once renowned Route 66. We will stop on Route 66 in historical Williams, Arizona for lunch, this is where you will find all sorts of memorabilia and Route 66 souvenirs. After Lunch we continue to the Grand Canyon with stops at Mather Point and Desert View, taking in the spectacular views. 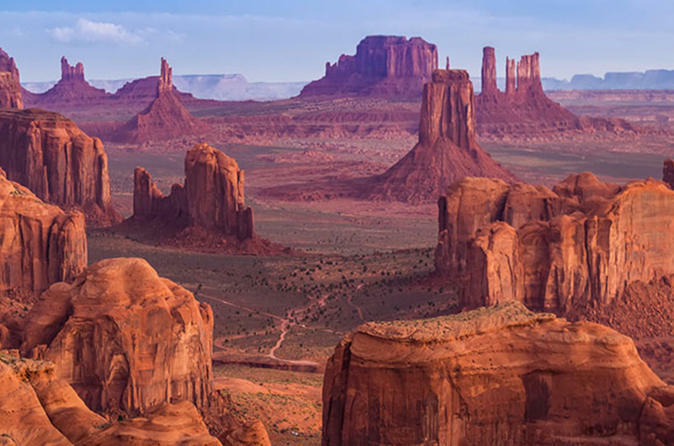 In the morning we head to Antelope Canyon, one of the most famous slot canyons created by flood waters on the Navajo Reservation, after our Navajo guided tour through the upper antelope canyon we head on to Monument Valley for an open vehicle tour through this amazing valley. Upon our return we head to the famous Horshoe Bend. Breakfast at the hotel and departure towards the city of Page Arizona was built to house the workers of Glen Dam and the creation of the second largest man-made lake in the US, Lake Powell, 1960 miles of shoreline, 186 miles long, named after the explorer John Wesley Powell. From here we will head to the beautiful Zion National Park with all its amazing views and hiking trails. We will spend some time at the Zion Lodge, taking on either one of the trails or a tour on the scenic Zion Shuttle Trolley Tour and then head towards St. George Utah for a late lunch, driving through the Virgin River Gorge then the Mojave Desert. Today we drive through 3 states on our way back to the Excalibur Hotel in Las Vegas, Nevada for an end to a fabulous tour.